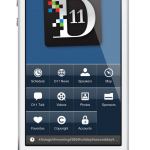 During the opening session of AllThingsD's D11 conference, Apple CEO Tim Cook was asked by hosts Walt Mossberg and Kara Swisher on the subject of wearables. 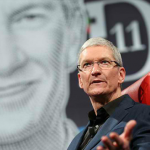 "I think wearables is incredibly interesting and I think it could be a profound area for technology," answered Cook. 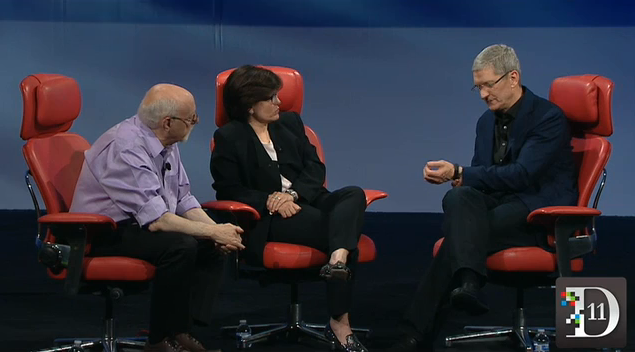 After showing the FuelBand that he happens to be wearing, Cook said that Nike did a "great job" with the popular iOS-integrated fitness wristband. But Cook is of the opinion that "there's nothing great out there" among wearables that, unlike FuelBand, does more than one thing. "There's nothing that's gonna convince a kid that hasn't worn glasses or a band to wear one," he said. If you can't see the video embedded above, please click here. Of course, perhaps the most popular wearable that does more than one thing is Google Glass, which Cook doesn't seem to think highly of. "I wear glasses because I have to," Cook said. "I don’t know a lot of people that wear them that don’t have to. They want them to be light and unobtrusive and reflect their fashion. … I think from a mainstream point of view [glasses as wearable computing devices] are difficult to see. I think the wrist is interesting. The wrist is natural." Which is itself an interesting thing for Cook to say, considering that Apple has long been rumored to be developing a wearable product of its own in the form of a wristwatch-like device commonly referred to as the "iWatch." But when asked if Apple will be one of the companies engaged in the area of wearables, Cook was quick to dodge the question. "I don't want to answer that one," he said, "but i see [wearables] as another very key branch of the tree." As someone who's very keen on wearing an iWatch, I'll take that as a yes, Tim.